← How precious is your unfailing love, O God! On Saturday (Sept 26) Carol and I drove down to Fall Creek Falls State Park in TN. We stopped at an interesting outcropping of rocks and a pool of water. 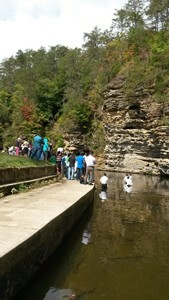 There was a large crowd of people there and as we approached we could see that is was a baptism service. It was obvious to us that this church group was Spanish-speaking. We talked with a few of the people there and learned that about 90% of the 200+ member church were from Guatemala, many from Huehuetenango. The pastor of the church attended Guatemala Bible Seminary in Chimaltenango. In 2014 he and his family were called to Tennessee to plant a church. This entry was posted in Kendalls. Bookmark the permalink.